It is arguably the most important metric to measure the success of your software or mobile application. Total downloads, additional income via in-app purchases and time spent mean very little if you can’t keep the motivation to use it on a decent level. And the overall success of your endeavor depends highly on this. Many strategies have been conceived and applied to keep engagement up over the years. The one we’re talking about today is frequently overlooked as a hard-to-learn, hard-to-apply one. But fear not; let’s talk about Gamification and its potential to drastically improve engagement. When video games were created last century (ancient history, I know), they were designed as software used to challenge the user, giving him or her some tools and teaching basic rules to overcome it. The human mind has always been fascinated by a new challenge it doesn’t fully understand at first; thus the appeal and overwhelming success of the video game industry. Fast forward to the present day as we use the term Gamification to define a series of actions we can use to trigger these feelings of challenge and accomplishment to fully engage our users. Let’s talk about three particular reasons to consider it a feasible way to increase engagement. Gamification provides a reason to come back. Last year Silicon Valley analyst Andrew Chen, published some interesting facts: the average app loses 77% of its users in the three days after downloading. After a month, 90% of users eventually stop using the app, and after three months only 5% of users continue using a given app. So how do you prevent being part of this? 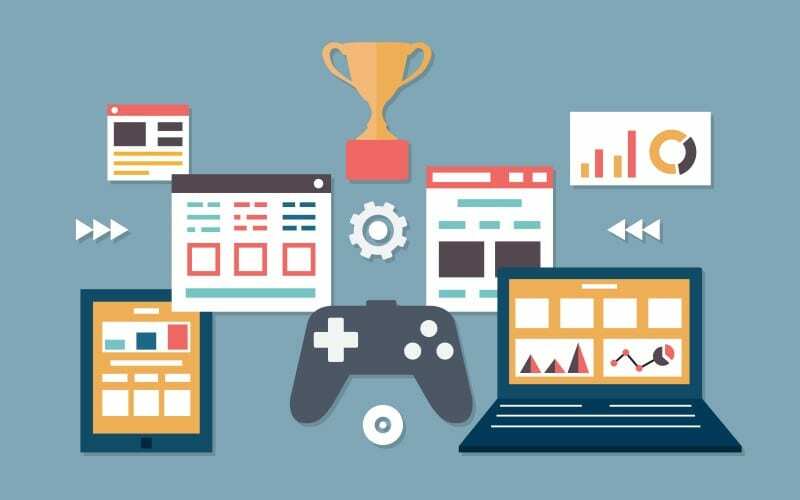 While not a silver bullet, and it doesn’t work in every instance, Gamification allows users to keep coming back for more by utilizing the same tricks the video game industry uses. Think about apps like Swarm, used to check-in on a place you’re visiting but with elements like leaderboards and unlockable badges for those who keep using it to brag about their fancy Friday night dinner, etc. Fitness apps have adopted Gamification quite well by letting users connect their social networks and compare their performance to their friends’. Defining numbers and metrics is one of the first challenges but correctly doing so will allow your app for some (healthy, we hope) competition and the desire to be the very best. We talked about challenge before and we have to keep in mind users can challenge themselves, their friends, or the whole base of users. There are strategies for each of these scenarios to keep users engaged. Gamification helps shape your app. Even if you keep a healthy percentage of users engaged over the years, you’ll need to update and adapt your apps over the years. Gamification gives you a better picture of which behaviors your users favor, valuable statistics, and a roadmap you’ll be using to shape future versions of your app. Improve on the challenge provided to your users, enhance social and sharing options and let your users determine the elements of your app that do matter. Competition, bragging rights, challenge, sharing, complete mastery of mechanics… All these elements among many others keep engagement up and users coming back to your product giving it a healthy life cycle. Ask us for more information about Gamification and its potential benefits on your app.